with Electrobraid™ as a board protector. with Black Electrobraid™ as a board protector. without the unsightly look of fencing! Switches should be set above snow height. Wires should be fastened to post to protect them from damage. Heavy wet snow can short electric fencing. To prevent this, fences in areas prone to snow accumulation can be wired as illustrated. 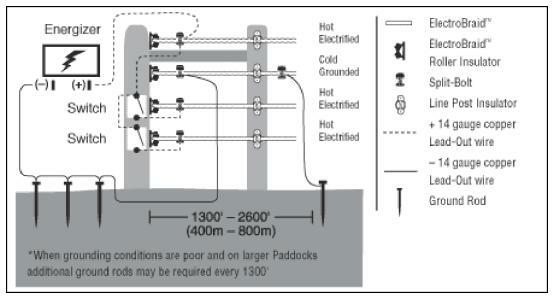 Cut-Off switches can be installed to allow you to progressively turn on and off the bottom Standard Energizer Fence Wiring Diagram strands with the changing depth of snow. Wire your energizer as shown in the diagram. With ElectroBraid™ fence you are building the equivalent of a “boxing ring”. 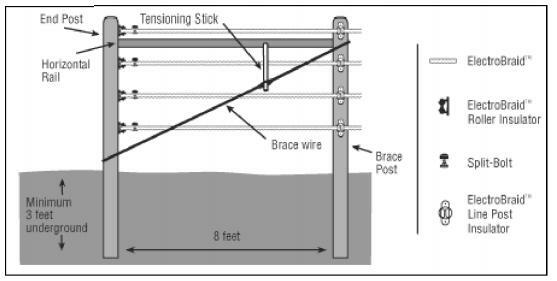 The corner and end posts must be strong enough to withstand the forces that would be transmitted if a horse were to strike the fence at speed. We suggest setting your top strand at withers height (or at least shoulder height) of your tallest horse and the bottom strand somewhere between hock and fetlock based on your specific needs or preference. You should then install the balance of the strands by spacing them equally. Use a hot-cold system – – ground the second-from-the-top-strand of Braid™. Small paddocks can be hazardous to very active horses.To fence small paddocks and pens, consider using an ElectroBraid™ Top Line with a heavy grade of Diamond Mesh, V-Mesh or a heavy grade 2-by-4 No-Climb. Install your ElectroBraid™ fence as recommended with 3 or more strands of Braid™.